G. J. Utterson is one of my all-time favourite characters. Maybe you're new to my blog, or haven't been paying attention to every detail of the rambles I've been publishing over the past couple of years. So you ask – who? Doctor Henry Jekyll's level-headed lawyer friend from the novella-turned-musical Jekyll & Hyde, I answer. Why on earth would that be anyone's favourite character, you ask. And that's what I'm here to explain. Ever since falling in love with this musical, I've spent countless hours discussing and analysing Utterson. Here, I'm going to compile my thoughts about the character in one post. 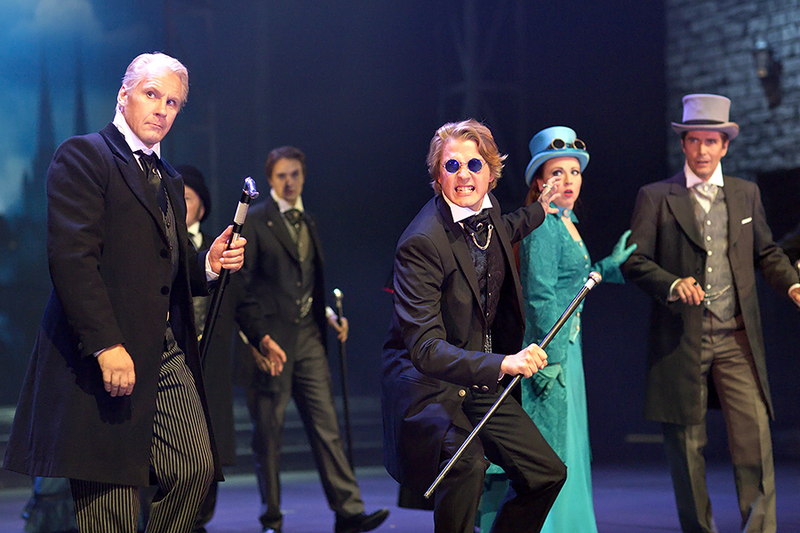 A scene from Det Ny Teater's Jekyll & Hyde, featuring Kurt Ravn as Utterson. Let's start from the beginning. Gabriel John Utterson is the point-of-view character of Robert Louis Stevenson's original novella Strange Case of Dr Jekyll and Mr Hyde. The book follows him investigating the relationship in between his old friend Henry Jekyll and the evasive evil-doer Edward Hyde. In the Frank Wildhorn musical, Utterson is a mashup of his book counterpart and another novella character, Dr. Lanyon (an old acquaintance of Dr. Jekyll's who witnesses Hyde turning into Jekyll). Musical Utterson is a lawyer who handles Jekyll's affairs, and since Jekyll is getting married in the show, he's also Jekyll's best man. It's implied he's good friends with Jekyll, and... that's about it. Utterson doesn't have too much personality of his own, unless you count "protests spending the night in a house of ill repute" a character trait. I've touched upon this in an earlier blog entry. In a way, the musical version of Utterson is a stereotypical badly written female character. He only exists in relation to the leading man with no agency of his own. 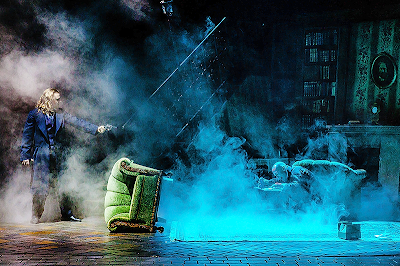 He's there because Jekyll needs someone to talk to (and heaven forbid that someone be Emma or Lucy – the women of Frank Wildhorn's musicals simply do not work that way) and because his reactions to Jekyll's actions keep the plot moving forward. Even so, Utterson is important. I've probably mentioned it before that I relate to Jekyll and Hyde's story via Utterson. For me at least, it's pretty hard to identify with a mad scientist who splits his soul in half, and the musical's women are a bit too stereotypical to feel real. But then there's Utterson. He's the everyman, someone who tries to help his friend but cannot save him. Knowing a loved one's in trouble but not being able to help – I guess most of us know how that feels. Utterson is not a completely realistic character either. He is the ultimate friend, almost unrealistically loyal. Jekyll doesn't understand how good he has it, having someone as trustworthy as Utterson in his life. Finding out that his best friend has murdered several people doesn't matter, he still stands by his side. That sounds too good to be true, and I suppose that's because the character's arc was given a grand total of two thoughts during all the years Jekyll & Hyde was under development. Above all, Utterson is a plot device. The script doesn't bother explaining why he keeps supporting his friend, even when said friend first behaves like a jerk and then turns out to be a serial killer. When you just look at the script, Utterson is likeable, but hardly favourite character material. Personally however, even though it sounds odd, I'm fascinated by theatrical characters that don't have many defining characteristics in the script. It's extremely interesting to see how different actors and directors choose to portray them. When the script only offers a vague outline, how will they finish the sketch and colour the picture? songs that feature Utterson. Here's one of them. Utterson is a plot device. Yet I cannot understand why many productions treat him as one. Watching Jekyll & Hyde videos online, from Broadway and theatres all around the world... Sometimes, actors make the best out of the material they're given and make Utterson a sympathetic, caring gentleman – check out Broadway's George Merritt for a charming performance. But all too often, the character doesn't seem to care. Best friend getting married? Meh. Best friend shutting himself in his laboratory for weeks? Blah. Best friend turns out to be a murderer? Nah. 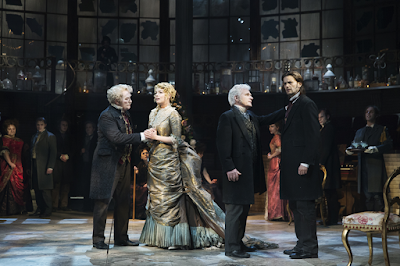 Amidst the paper-thin characters and two-dimensional romances of Jekyll & Hyde the musical, Jekyll's friendship with Utterson is actually the most meaningful relationship the titular character has. Unlike the ladies, Utterson knows Jekyll's secret, and he is the one Jekyll turns to for help, time and time again. I believe he has more scenes with Jekyll than either of the women. So for the life of me, I cannot understand the productions that don't make something out of that. Why settle for blandness when you can have worry, shock and/or despair! Luckily, I've only had to be annoyed at Youtube videos so far. Seeing Jekyll & Hyde the musical live, I've only encountered good Uttersons. Or absolutely amazing. Turun kaupunginteatteri's production. Photo by Robert Seger. My favourite Utterson is Severi Saarinen, who played the role in Turun kaupunginteatteri's 2013–2014 production, directed by Tuomas Parkkinen. Seeing the show for the first time, I liked the character. Seeing the show for the seventh and final time, I was in love. My first couple of times seeing Jekyll & Hyde were spent admiring the spectacle. Musicals in general are not a subtle medium, and even with that in mind, Jekyll & Hyde can hardly be called a subtle show... So it took me a handful of performances to look beyond the blood, explosions and showstopping ballads and to start wondering what's really going on in the characters' minds. It turned out there was quite a lot of going on, in Utterson's mind especially. Paying more attention to the performance, I came to the conclusion that Utterson was unrequitedly in love with Jekyll (played by Riku Nieminen). It was rather discreet, since there is of course nothing in the dialogue that affirms it – but you could see it in the way Utterson reacted to Jekyll. Talk about a heartbreaking character arc. From bitterness in Jekyll's engagement party to sorrow in the final scene... It's been two years since the production closed and I still feel touched. Even with that undercurrent, I really liked how Utterson and Jekyll felt like true lifelong friends. I imagined they had known each other since childhood, had maybe gone to school together, had always been a part of each others' lives. It felt like a very real friendship in between two young adults, with a heartbreaking edge, if you paid close attention. I was also delighted by Utterson's somewhat misplaced sense of humor, with him at one point making such a terrible joke that he had to apologise for it. That felt like a perfect characteristic for a character who, in the original novel, calls himself Mr. Seek since he's looking for Mr. Hyde. To this day, Saarinen's Utterson remains on my list of all-time favourite theatrical performances. I've been wondering how it's even possible for one performance to leave such a big, lasting impact on me. Sure, it's no secret Saarinen is one of my all-time favourite actors, there's just something about his stage presence that gets me every time. But beyond that, the performance made the whole story feel more real to me. We're talking about a show where the main conflict revolves around a guy melodramatically tearing his soul in two and then going on a murder spree. In a grand horror story about good and evil, observing a character quietly go through his personal heartbreak that suddenly gets amplified to larger-than-life proportions... It helped me to think of the musical's characters as real people. To me, relating to the story from Utterson's point of view made it feel so much more heartwrenching and relatable, and therefore way more memorable. with Hannu Lintukoski as Utterson. Photo by Jiri Halttunen. There is also another Finnish Utterson I really like. The second Finnish production of Jekyll & Hyde, directed by Anssi Valtonen, premiered last fall in Jyväskylän kaupunginteatteri. I'm quite charmed by their Utterson, played by Hannu Lintukoski. In many ways, this performance is closer to the calm and serious character from the novel, but there's also a unique spin to it. Lintukoski plays opposite two Jekylls, Henri Halkola and Joni Leponiemi. These guys are all a bit older than the Saarinen/Nieminen combo, and here, Utterson seems to be the more mentally grown-up member of the duo. Therefore the characters' relationship turns into that of an older brother and a younger brother. I imagine the whole Utterson family are longtime friends of the Jekyll family. Or maybe Utterson used to work for Jekyll's father when starting out his career and grew fond of young Henry. Whatever the case, the way I see it, this Utterson looks after Jekyll like a proud but slightly worried big brother. He wishes Jekyll would succeed in his experiment and feels it's sort of his duty to support him. At the same time, he is too much of a realist to ignore the dubiousness of Jekyll's ideas. This Utterson is both a reserved gentleman and the comic relief of the story. The production gives him comedic moments, most notably in The Red Rat (the poor guy wishes he could be anywhere else, or maybe dead). Yet in the second act, the character is very convincing in his worry and sadness. Not an easy combo to pull off, but Lintukoski does a fantastic job. Especially impressive when you remember how flat the character is in the script. These two favourite performances couldn't be any more different. And still, at heart, they're the same character – and I adore them both! That's what makes vaguely written theatrical characters so fascinating to me. You can have vastly different interpretations that still make complete sense in the context of their respective productions. Next time I'm seeing Jekyll & Hyde will be in Germany this June, an outdoor performance by Theater Vorpommern. I'm traveling escpecially for the actor playing Jekyll/Hyde – but of course I already know which character I'm going to pay special attention to. Here's to hoping I'll have an interesting performance to add to this list next month! Photos by Miklos Szabo, Robert Seger and Jiri Halttunen. Related reading: my reviews of Turun kaupunginteatteri's and Jyväskylän kaupunginteatteri's productions of Jekyll & Hyde.